With the holidays looming, there’s no better time to plan a road trip with the family. This will be great news to tell the children, who will without a doubt be excited about a journey to the ocean, or somewhere equally thrilling. That exhilaration, unfortunately, will quickly wane enroute, especially if the road being driven spans a healthy distance, and there’s no stimulation at hand. If you’re a parent, you know what a nightmare this can be. The spectacle of a cross-country family holiday can quickly become a draining affair, especially if the little ones aren’t kept busy. Don’t worry though, we’re here to help. Load up that Tata Bolt, and prepare for a memorable expedition! Here are some tips to ensure that your road trip is a smooth sailing, safe affair, and one that’ll have you feeling relaxed and energised, instead of stressed out. When school’s out, it’s only natural to want to embark on the journey immediately – you want to take advantage of all those days off, no doubt. Leaving straight away, or even a day or two after the holiday begins can prove to be a mistake however, because almost everybody is thinking the same thing. This results in bumper-to-bumper traffic – even on the outskirts of major hubs – which you definitely don’t want to spend your precious time sitting in. Rather depart after those peak periods, and make sure you do the same coming back too. Before you even get on the road, make sure you’ve plotted out an optimal course. You obviously need to make sure you’re not wasting fuel driving unnecessary extra kilometres (unless you’re specifically going for the scenic route, of course), but also, ensure that your chosen route has a sufficient number of pit stops on the way. These should include petrol stations, food outlets, and more, all of which will have possibly the most crucial component of every successful road trip – bathrooms. Keep in mind that the little ones may need to go more often than you do. Snapping on a seatbelt may seem like obvious advice, yet it’s an important point to emphasise nonetheless. Any parent can fall into the trap of letting their child loose in the backseat to give them room to play, but this is a major safety hazard. Keep your little ones buckled up, and make sure they’re as comfortable as possible for the long haul. 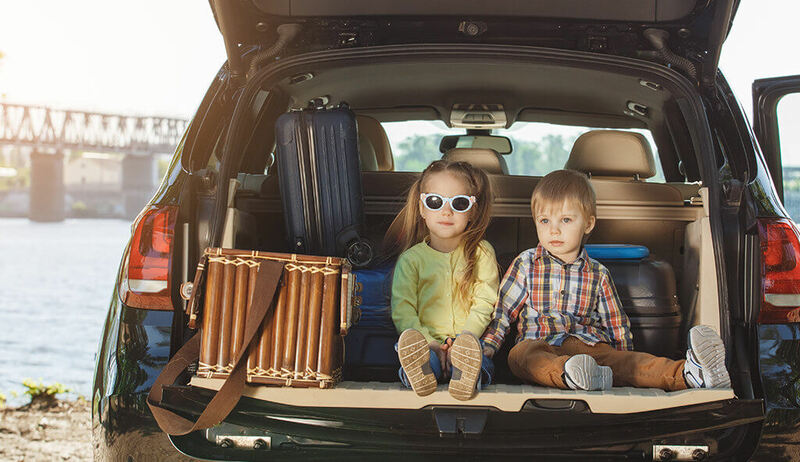 Your kids are going to need something to keep them busy over all those hours on the road, especially if they’re expected to sit in the same seat throughout. Thankfully, there are countless tools available that make pulling this off a breeze. Give your children a book to read, a cartoon to watch, or a portable gaming system to play with. You can interact with them too to mix things up, with a variety of classic road trip time passers, like “I Spy”, “Spot the Car”, and more. No road trip is complete without an excellent selection of snacks. Be mindful of what you give your children though. Anything packed with sugar for example, will have their energy levels running rampant, meaning they will become restless far quicker. Stick to healthier options rather, like fresh fruit and sugar-free treats. Getting to your destination in the shortest span of time is certainly an option to minimise any potential stress, but sometimes, it’s worth treading off the beaten path. Try find a picnic spot on your route for instance, or several other points of interest, and stop at each to stretch your legs and let your little ones explore. The overall travel time will be longer, yet you probably won’t even realise it – time flies when you’re having fun, after all. Wherever you’re heading to over the holidays, above all else, remember to be safe. Keep a respectable following distance from the car in front of you, don’t speed, and make sure to stop regularly, especially if you’re feeling tired. Take it easy, and enjoy the precious time away with your family!